PRS Password Recovery Software is Windows application for recovering over 40 popular programs passwords, including Google Chrome, Internet Explorer, Firefox, Opera and more. If you forget or lost your password, PRS can really help you to recover it. 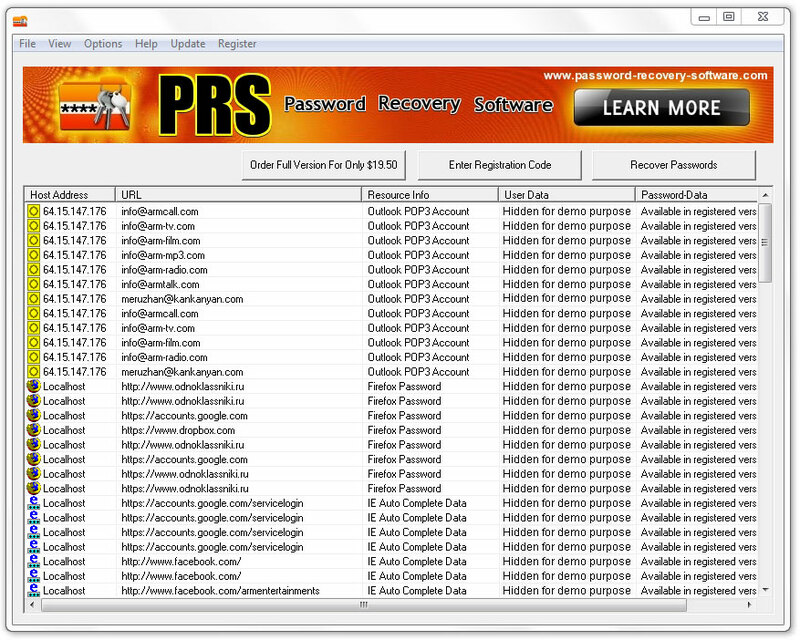 PRS Password Recovery Software is Windows application for recovering over 40 popular programs passwords, including Google Chrome, Internet Explorer, Firefox, Opera and more. If you forget or lost your passwords, PRS Password Recovery Software can really help you to find and recover your passwords. You can save revealed passwords as Txt File (.txt), CSV (.csv), Excel (.xls), Access Database (.mdb), Web Page (.html) or XML Data (.xml) file. Microsoft Outlook users can use MessageLock to send private email messages. Enter your message, click 'Encrypt Email,' and send. MessageLock will encrypted your message and deliver it to the recipient. Now integrates with Lockbin.com service! USB Flash Security is disk encryption software.It can protect your USB drive by password. Virtual encrypted disks are the best way to protect personal information on home computers. Data encryption takes place in real time and does not affect computer performance. The disk encryption software mounts encrypted containers as separate disks.